The 1911 census records Crozier Fleming Moffit as a seed merchant. He and his wife Eliza Jane were living with his parents on their farm in Belragh, Aughnacloy, Tyrone. John Anderson Moffit was born about 1923. 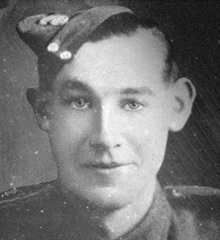 Corporal John Anderson Moffit was serving with the 2nd Battalion of the Royal Inniskilling Fusiliers when he died in Italy on 2nd May 1944, age 21. 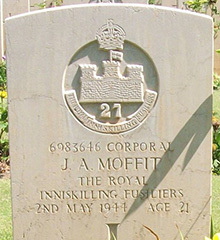 Corporal Moffit is buried in Beach Head War Cemetery, Anzio, Italy. Anzio is a coastal town 70 kilometres south of Rome. To reach Anzio take the Route No.148 Superstrada Motorway, which runs between Rome and Latina. Turn off the Superstrada at the No.207, following the signs towards Anzio. The route is well signposted from the Superstrada. The Cemetery lies 5 kilometres north of Anzio town on the No.207 and Commission signs are visible 150 metres from the cemetery.